Coming on a 1:10 scale on road, the Redcat Racing Lightning EPX electric drift car is a joy to watch and to operate. The Redcat EPX is wonderful for both children as well as adults and provides endless hours of entertainment to each age group. Here we will take a look at this rc drift car in depth and help you understand why it is one of the best additions to your rc collection. Loaded with an Electric Brushed 27T 540 motor, the car effortlessly moves around on a number of different terrains. The movement is heavily supported by the shaft driven 4 wheel drive operation. Made primarily of lightweight material with a 360x200x112 (mm) body, the forward and reverse movements is carried out with perfection, while with the excellent support of the wheelbase a steady control is maintained during drifting as well. The forward and reverse action with this drift car adds to the fun and excitement offered with this car. Want to avoid a pile-up? No problem! The drifting action is so flawless that corners feel like a chance to show off the performance, rather than as a challenge. The plastic chassis helps to regain performance after a long drift as well. The plastic does have its downside, however, and some people who own this RC drift car report that it is easily damaged. 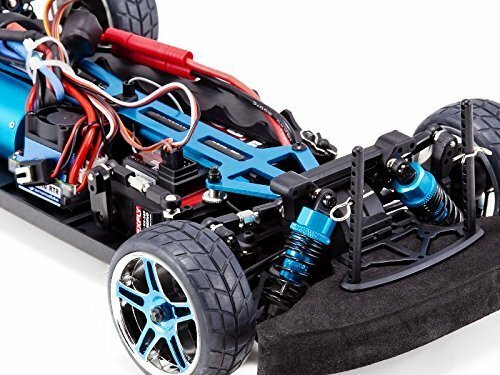 When it comes to control, the Lightning EPX Electric Drift Car is loaded with a 2.4 GHz Radio system. A reliable control mechanism is hence provided, not only gaining extra range of controlling the car in terms of distance but also exhibiting a better reflex towards multiple signals in succession. Thus when facing multiple corners or on trying to perform some fancy moves, the Lightning EPX Electric Drift Car delivers a stunning efficiency. The shocks are of an oil filled aluminum body, thus encountering a rough terrain or being subjected to shocks or moving through humps in high speed maneuvers makes it much easier than other cars of the same genre. The car is powered by a 7.2v 2000mah battery that promises a sustained performance avoiding any sort of glitches that might pop up when such cars are running low on battery. In addition to that, the battery also backs up the powerful Electric Brushed 27T 540 motor perfectly, thereby delivering an impressive show whenever operated. The battery is rechargeable and offers a long-lasting operation time so you’re playing more than you are charging. The color scheme is probably the best aspect to be pointed out when it comes to being visually appealing keeping up to the level of a regular size sports car. The car comes in an orange/black color pattern, the orange giving an otherwise black body a flaming look. Of course, this is just one of the many different colors available for the drift car. Purple/ Red and Green is also available. For those who want to enjoy a car with a sophisticated and stylish look that is still modern and trendy, this is a drift car that won’t let you down! Designs skillfully portrayed using grey and white on the hood and around the doors. 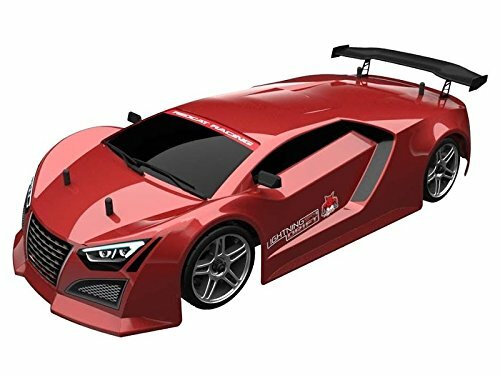 Finally, the black tinted front glass and windows with a cool headlamp design, the Redcat Racing Lightning EPX Electric Drift Car is a treat to the eyes as well as the mind when put in action. At a cost of about $140, this is an impressive drift car for anyone who wants to enjoy racing fun with an awesome car that does so much more than you imagine. While there are a number of drift cars on the market, they are not all created the same. The Lightning EXP is one that you will be perfectly satisfied with. The vehicle features a number of impressive features, great functioning and a price that you will love. Amazon has the best deal on the drift car, as well as other perks that come along with the purchase, such as free shipping. Whether you are new to the world of drift racing or have been an avid fan for quite some time, this is the perfect rc drift car to add to your collection!